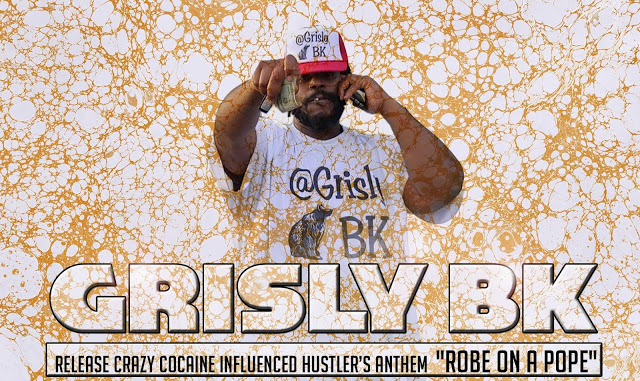 UM2N - Grisly BK Releases Crazy Cocaine Influenced Hustler’s Anthem "Robe On A Pope"
Grisly BK releases crazy cocaine influenced hustler’s anthem "Robe On A Pope"
The up and comer Grisly Bk is back at it with a hot trap track -Robe On A Pope- music video. The song brings to mind comparisons to The Notorious B.I.G.’s debut Ready to Die, unleashed back in 1994. The track highlights open-air crack deals, robberies at gunpoint on the A train and shootouts with the N.Y.P.D. The Brooklyn, New York’s rap artist Grisly BK has successfully brought the past into the present with his style. If you’re hanging on the fence about this talented artist, be sure to check his E.P, two mixtapes and two singles to get a glimpse of this lyricist. This track portrays an artist that grew up on gangsta music in the crack era. It’s without a doubt that he listened to guys like Kool G Rap, I’m glad we have someone representing Brooklyn so damn hard. This track is exquisitely gritty as it gives you the impression of walking down a dark street with a gun at the back of your head, yet you feel like wildin out to it.